Soak 1 cup aval in curd for 10-15 min. After that mash with karandi or hand. Add 1.5 cups idli rava ( idli rice broken like rava available in shops) and keep aside 15 min. Adjust water and curd ( totally u may require 1 to 1.5 cup curd based on its sourness) for idli batter consistency. Add salt and eno or baking soda and immediately make idlis. 1. 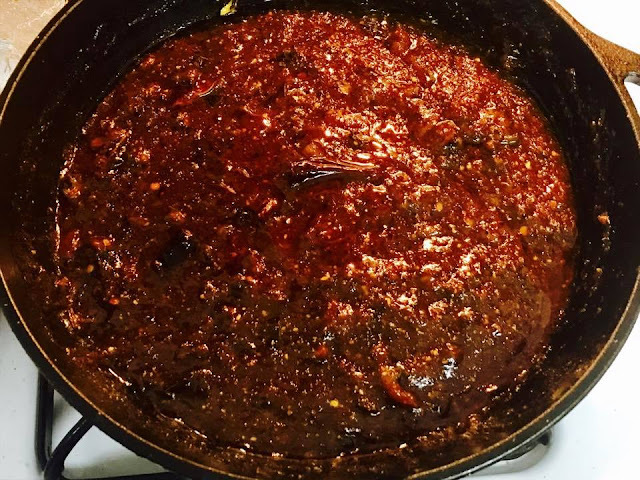 In a little oil, add urad dal, red chilly. Fry till golden brown in color. Keep aside. 2.same pan add chopped onion, sauté well. 3. Add tamarind and curry leaves. Cool down. 4. Grind well. Season with mustard and hing. Serve with idly, Dosa, and paniyaram. 2.Then add buttermilk, water and salt. Whisk well with no lumps. 3.Consistency should be watery. Wait for 30 minutes. Keep the griddle nice and hot. Start to pour from outside to inside. Add oil generously. 4.Keep medium to high flame. Cook one side till it reach to golden color. 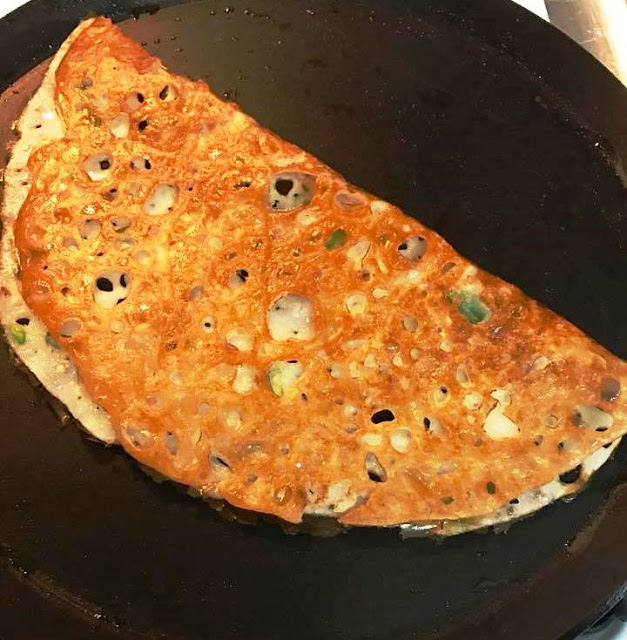 Yummy Rava Dosa is ready..! Take 1 cup of All purpose flour / Maida, add a handful of cut pieces of coconut, finely chopped greenchilly and finely chopped curry leaves, 1/2 cup of sour curd mix well and make it like dough and keep aside for minimum 2 hours. After 2 or 3 hours, add a pinch of Baking soda (if you wish), mix well and adjust the consistancy of the batter to Vada batter. Take in hand and drop in oil and deep fry. 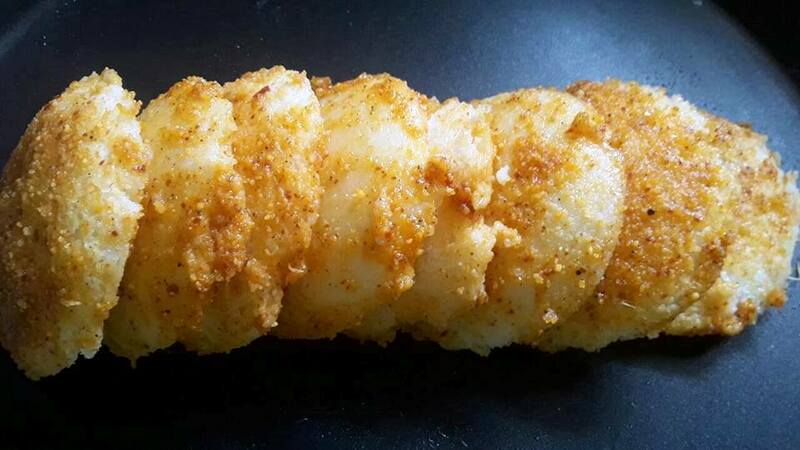 Deep fry in medium flame and serve hot with Spicy / Coconut / Green chutney of your choice. Your Goli Bajje is ready... !!!! Cut remaining idlies into 1 inch cubes and keep aside. Chop pyaaz into lenghty one. Slit green chillies and keep aside. Take a cup of milk, add Organic colour and mix well and keep ready. Julienne cut ginger and keep ready along with curry leaves. In a kadai, add coconut oil, temper mustard seed, urud dal, channa dal, curry leaves, add ginger, chilly and onion one by one and saute n high flame. Add the cut idlies, salt and stir again. Now pour the milk and mix well. Adjust salt to taste and saute in high flame for 1 minute until all are mixed together. Serve hot. No side dish required. 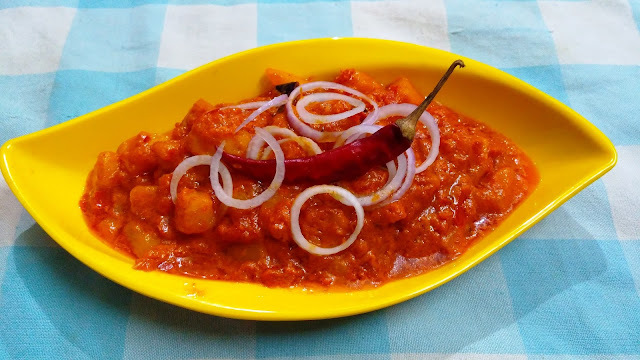 A nice dish for kids who hates to take Idly as it is. 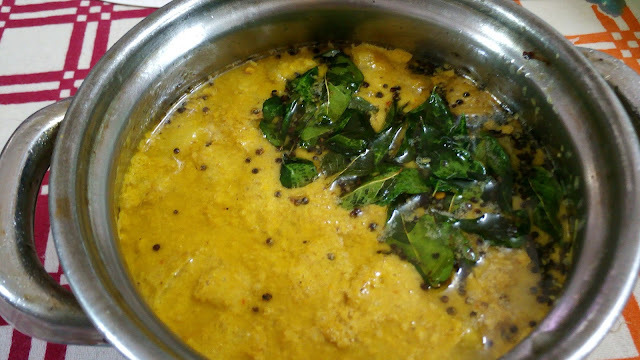 A typical Kerala dish prepared using vayana ela(bay leaves)and the flavour of this when cooked is awesome.This is prepared in my home town Trivandrum during famous Attukal Pongala. Method : Mix all the ingredients and make a dough. 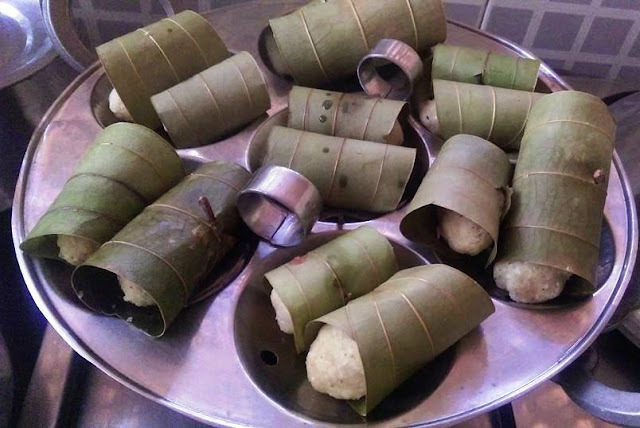 No need to add water.The moisture of the banana and jaggery is enough to make the dough.Fill this dough in the leaf and roll it and steam it in a steamer and cook for about 10-15 mins.The appam will have the nice aroma of this leaf. Tomatoes .. Medium size .. 4 nos..
Coriander seeds .. 1 teaspoon .. Method : Take grated Vaazhakkai, Salt, Besan, Red chilli powder & heeng .. mix all to make pakodas. Heat Oil .. put the pakodas.. fry till its golden brown and remove and put it in a tissue paper so that the oil is soaked. 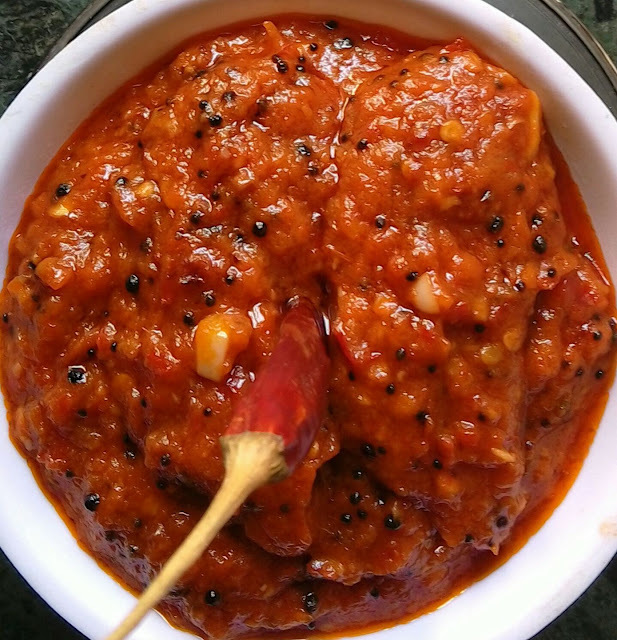 For Gravy ... Cut the tomatoes, add ginger, red chillies, coriander seeds and grind them to a fine paste. PS.. In case if the pakodas become hard.. put them in hot water for some time and remove them. It will become soft. This cuisine is one of the items being served in almost all the hotels. Once you go with family, the first item being ordered by any of the family member would be this cuisine only due to the richness. Let us see today how this being made. Take 200gms of panner, wash in water, dip in hot water for few minutes, remove and cut into 1/2 inch pieces and keep aside. In a kadai, add 4 to 5 tsp of pure Unsalted Butter and saute finely chopped onion until its golden brown. Add GG paste, tomato one by one and cover with a lid for 3 mins, until it is cooked. Mash it with the potato masher until its fully mashed and forms in meshy form. Add Turmeric, Kashmiri Red Chilly, Coriander and Jeera powder to the required quanity of spicyness, and a 1/2 tsp of garam masala and mix well. Add the chopped panner and mix well. Check for consistency, and if required add little water and cover it with a lid, until oil ooze out on the sides. 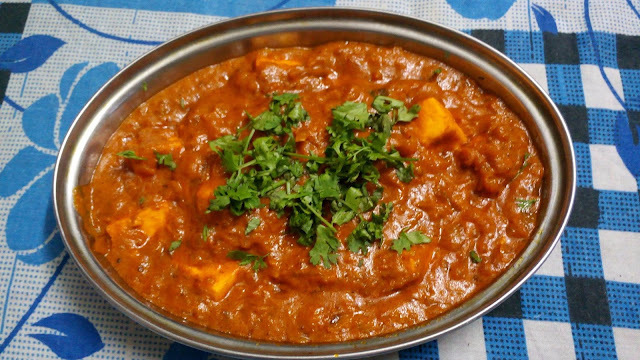 Garnish with chopped coriander leaves and 1 tsp of fresh cream and serve hot with Roti / Naan. 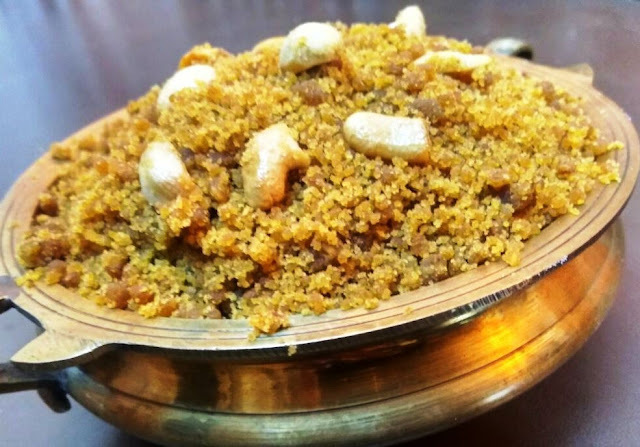 Jaggery-3table spoon or more as per your taste. 1. Dry roast sesame seeds and dry coconut separately. Powder them together. 2. In a kadai add oil, roast all the items. Cool and make a paste. 3. In the same kadai add 4 table spoon sesame oil. Season with mustard, hing, curry leaves and red chilly. then add thin sliced ( cut circle and divide them by 4) bitter gourd and fry well in the oil along with little turmeric. Once half cooked, add tamarind water, salt and jaggery. Let It boil for about 15 minutes. Then add the Chenna paste. Let it boil for 20 minutes. Then finally add sesame powder and coconut powder mix and boil for 10 minutes. It should come like a legiyum ( thick) consistency..! Enjoy this authentic recipe for Dosa, curd rice,and roti..! Note: self life will be for a week in the fridge. Use dry spoon. 1. Add 1spoon ghee. Fry wheat flour well. It may take 10 minutes on medium flame. 2. 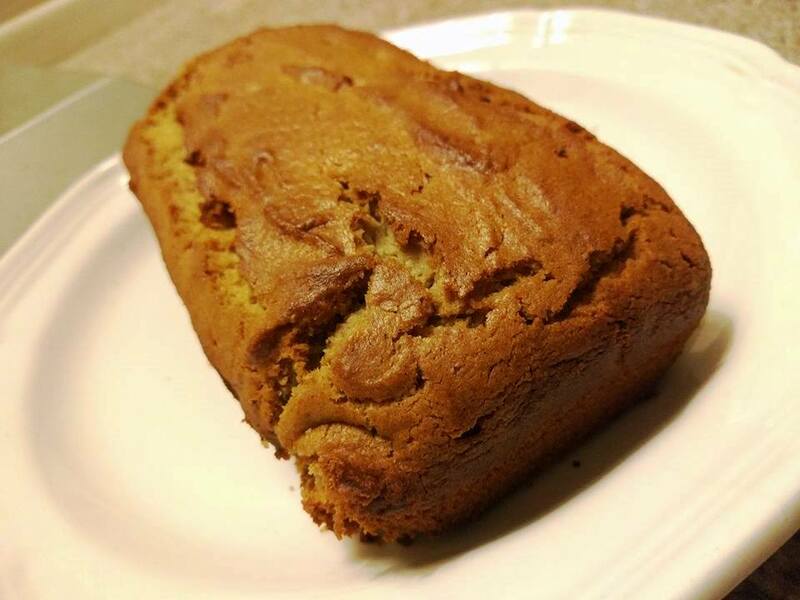 Once raw smell goes from the wheat flour, it lightly changes color. Add hot milk to it gradually. Keep stirring. Add little more hot water if you need. 3. After it forms a thick paste, add sugar and mix well. Once you add sugar, your Halwa changes to brown color. Gradually add ghee. 4. Once it becomes like a mass and ghee comes out, add roasted cashew and cardamom. 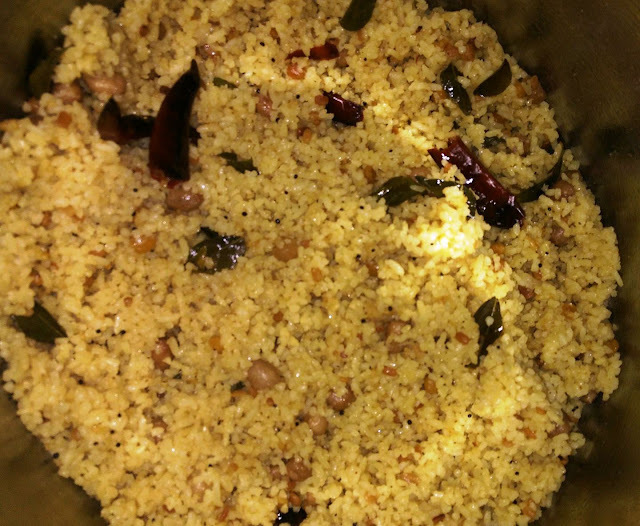 A special recipe from the southern most part of Tamilnadu. 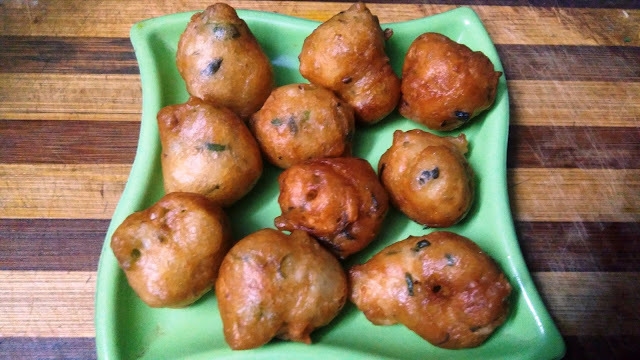 The name itself identifies that 2 types of pulippu is available in this kuzhambu. Even the trambrahms of border of Kerala would have this recipe in their food often. In a kadai, add Red-chilly, urud dal, Methi seeds and saute well. Add to this grated coconut grind it to fine paste and mix with 1 cup of curd and keep aside. 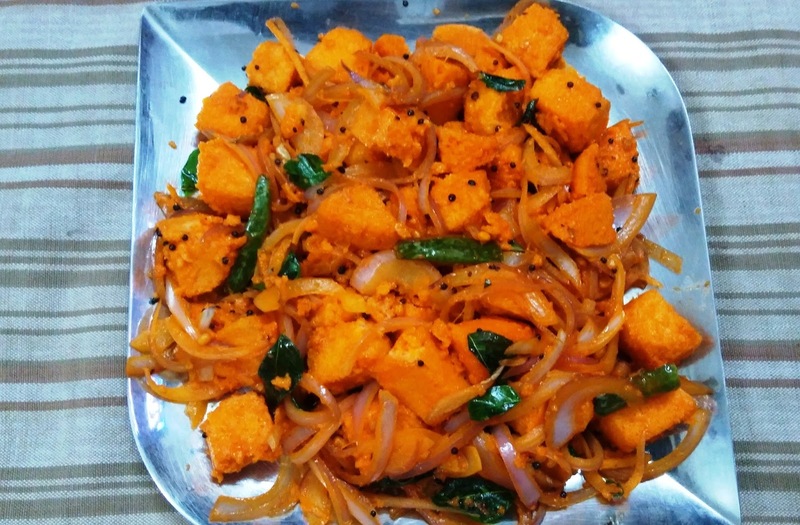 In a kadai, add chopped Pumpkin and drumstick with 2 tsp of oil and saute well. Add tamarind paste and bring to boil. Add salt, turmeric powder and asafotida and cook well. Once cooked, add the curd paste and allow to cook. Take care that once bubbles try to start on the borders, switch off the gas as once curd is added it should be totally boiled. Now garnished with tempered mustard seed and Curry leaves in Coconut oil only. 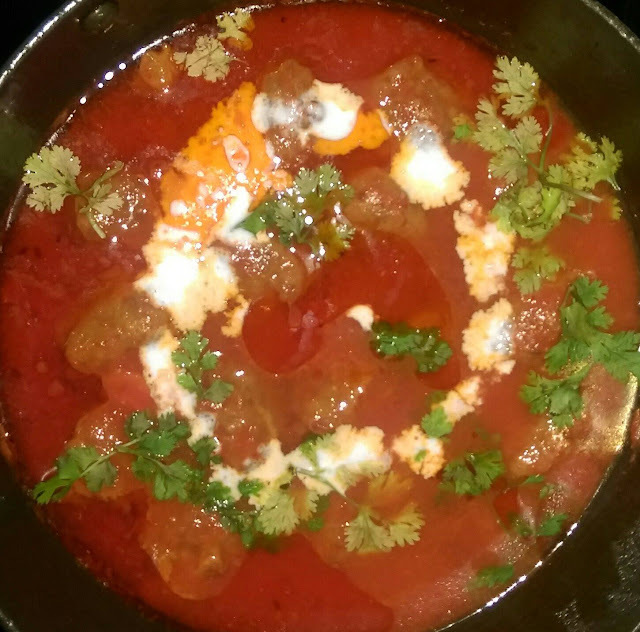 This goes yummy with plain rice and kids would love to have once more time. Preparation by Student Chef - Varshini. Ingredients : Finely chopped tomatoes 4 to 5 nos, Fennel seed powder, turmeric, red-chilly, coriander, cumin, garam-masala powders each 1/2 tsp. 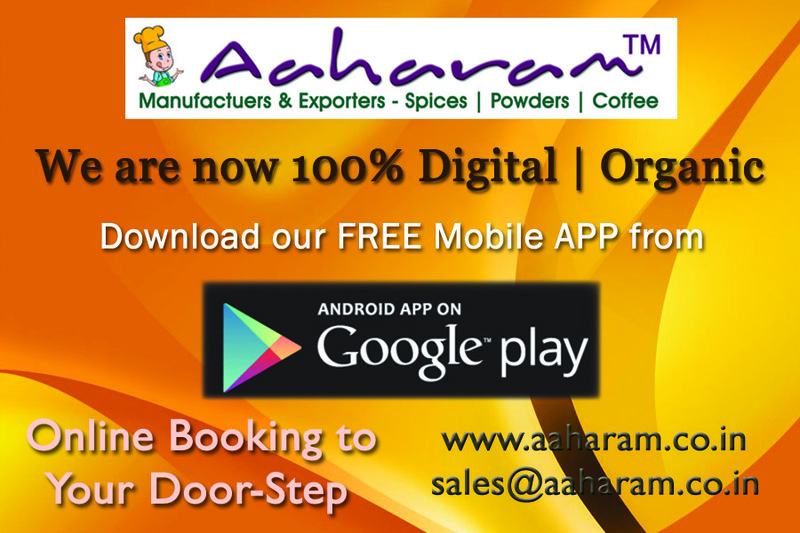 Oil, salt, asafoetida as required, Boiled potatoes / Baby potatoes - 200 gms, Bayleaves, Cardamon and Cinnamon for sauting. 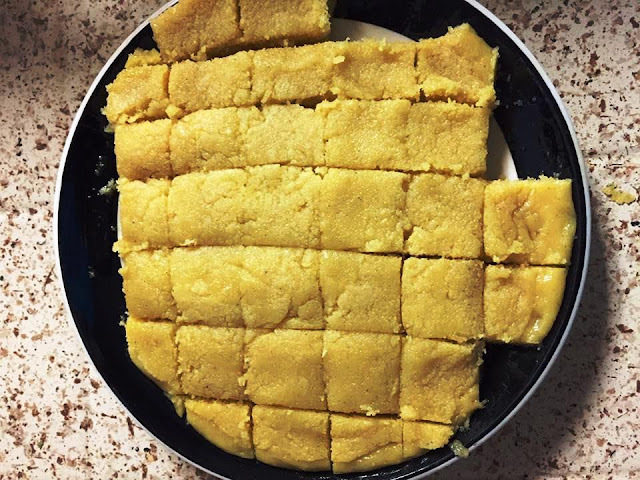 This is made with Channa dal and mostly made during Diwali. Roast 1cup Channa dal till a nice aroma comes. Transfer it in a pressure cooker and cook it for 3-4 whistle. Drain the excess water with a strainer. When water is drained put it in a mixer and grind it into a nice powder. Keep a kadai add 1 1/4 cup jaggery and half a cup of water and keep it in flame. Let the jaggery dissolve in water completely .Remove the vessel from the stove and strain the jaggery water to remove the dust and residues. 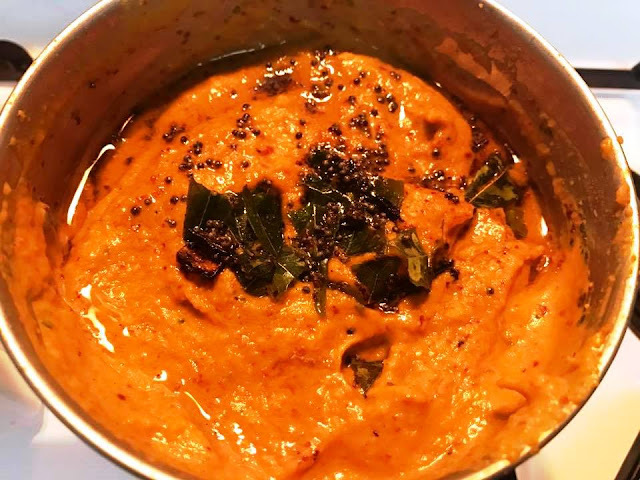 Place the kadai on the stove and allow the syrup to boil.When the syrup starts to thicken,add the Channa dal powder and stir continuously.Slowly the Channa dal mixture starts to crumble and becomes soft like puttu. 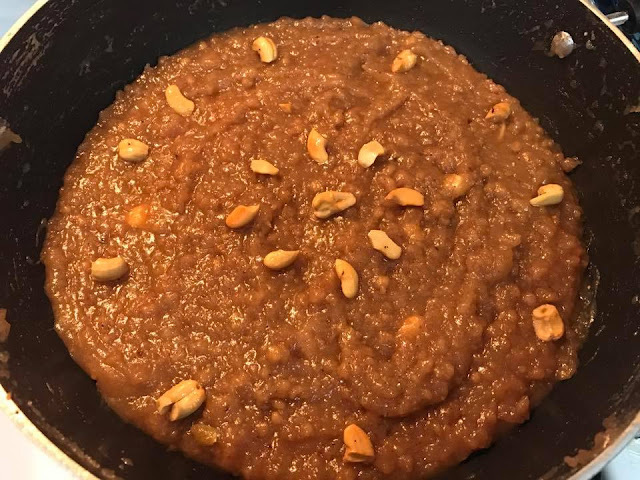 Add 1 tbsp ghee and simmer the flame and stir continuously.In another pan heat ghee and fry the cashew nuts.Finally add this to the okkarai along with some elachi powder and mix well. Okkari breaks to smaller pieces and should be soft.Pidicha pidi padanam uthutha uthiranam. That should be the consistency. In olden days gingelly oil was used to make this sweet. If you like the flavour of gingelly oil can add 1-2 tbsp of oil.Delicious okkarai is ready to serve. Puli pongal or puli uppuma.. Method : Take a heavy bottomed kadai...or directly in cooker...pour 4 or 5 spoons oil...when hot do seasoning... Add noi arisi or broken arisi...fry a minute...add tamarind juice n 2 tumblers of water...add salt...( u can add one spoon sambar powder or rasam powder... It is only optional)...let it boil...once water thickens close cooker with lid and put whistle... Keep 5 minutes n switch off...enjoy puli pongal with pickle... Vadam. Method : Preheat oven to 180 degree Celsius. Blend bananas well. Add sugar,oil and vanilla extract and mix well. Add atta, baking powder and baking soda to the wet mixture after sieving. Mix all the ingredients well without lumps. Bake for 50 minutes in a greased pan. Inserted toothpick should come out clean for the cake to be baked well. Add the besan to the above mixture and keep in oven for 3 mins.., take it out and stir well after 1.30 minutes , u can add cardamom powder at this point of time if u wish .. Keep it again in oven for the remaining 1.30 mins..
And the outcome will be so so yummy !!! 1. In a pressure Cooker, add oil and ghee. Add jeera,finely chopped onion. Sauté till it turns light brown color. Add green chilly paste, ginger and garlic paste. Sauté till raw smell goes. 2. Add all powders, then salt, tomato purée, then wait for 5 mts. 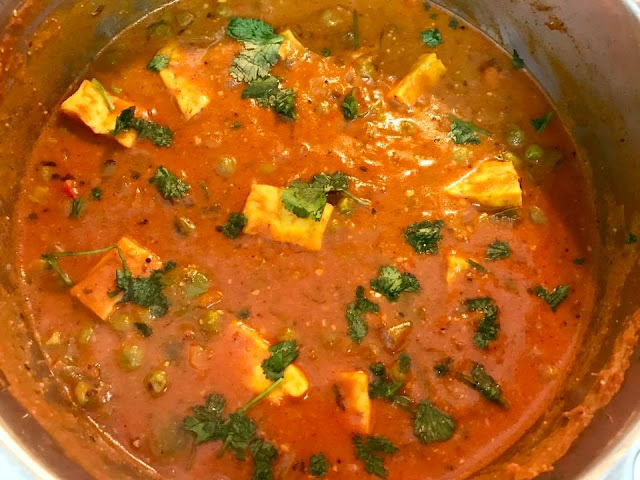 Once oil oozes out from tomato add peas, bell peppers, paneer, kasuri methi, cashew paste, milk, 1/2 cup water. Close the lid and pressure cook for 2 whistle. Garnish with coriander leaves. Enjoy with Roti, pulav or poori..! !